Pak Eagle Enterprises will provide you with an innovative, attractive and professional web design that will assist you to open new markets for your business. 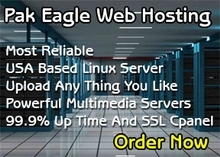 Pak Eagle Enterprises and its high caliber designers will craft the perfect look and feel for your website, our skilled programmers will implement the latest technologies in developing your website and our experienced marketing managers and consultants will drive qualified, targeted sales leads from the major search engines to your website. Pak Eagle Enterprises strives to create professional web sites that will effectively promote our clients products or services to their target audience. We listen to our clients and develop a custom made web site that will enhance your overall corporate image. Unlike your standard newspaper or phone book ad, a web site can contain an unlimited amount of information at a fraction of the price, and is accessible by millions world wide. Any aspect of your site can be updated monthly, weekly, or even daily, to have current information for your readers. This information can be accessed with a click of a button from around the entire globe, 24 hours a day. Statistics show that there are over 300 million people on the Internet today. Those numbers speak for themselves. At Pak Eagle Enterprises, we are developing your ideas into reality.